In this 1.5 hr workshop, learn tips and tricks to help target and relax tight muscles through self massage using Roll Model® Massage Therapy Balls. We will explore the body's top tight spots from feet-to-head leaving you feeling relaxed and supple. You will learn how to find your cranky spots and techniques for self massage leaving you with the self care knowledge for at home application. We’ve teamed up with Nadeem Jiwani owner of Float Valley and Brianna McIntosh , our talented Thai Massage Therapist to offer you a day of complete Full Body Self Care. *This is an intimate retreat and spots will go like hot cakes. Be sure to register through the MINDBODY app to snag a spot. Sensory Deprivation tanks aka “Floating” allow you to destress and recharge. To float, you simply enter the specialized chamber and lie down in the water. The water in each of Float Valley’s 6 float tanks contains 800 pounds of magnesium-rich Epsom salts. This dense solution allows you to float effortlessly to the top. Float tanks are completely light-proof, sound-proof, and odourless. You can’t feel the water because it is heated to the exact temperature of your skin. This environment puts your body into a state of profound relaxation. Freed from the constant stress of gravity and external stimulation, the float tank allows you to completely relax your body and mind. This reduced sensory environment has been researched by neuroscientists for its overwhelmingly positive effects on stress, anxiety, and pain. There is nothing like the complete stillness of floating! A 6 week handstand program for students who wish to either start incorporating handstands, or wish to improve their current handstands. A single day workshop is never enough time to truly learn proper techniques and truth be told, a handstand doesn’t require a lot of strength or a specific body type, it’s all about joint stacking, mobility, and little engagement. Constant play, practice and repetition is key to acquiring handstands. Over the six weeks Keith will give each yogi the opportunity to improve mobility through shoulders, hips, back and legs as well as functional core strength and proper engagement in relations to handstands. NOTE* limited to no more than 10 students in order to keep the student teacher dynamic low, allowing a lot of personal attention to each individual. Click the link below and scroll to the bottom under the ENROLMENTS section. *limited to 8 students only for maximum teacher to student attention! An EPIC off the beaten path yoga adventure guided by Ellen Reesor and local mountain athlete, Connor Koch. Including geothermal hot springs, hiking or trail running in the Colorado Rockies, America’s tallest sand dunes, local breweries + live music, lodging in sky lit yurts and all the hidden gems you wouldn’t ever see otherwise! As a thank you to our students, and a jolly kick-start to a brand new season! Join us on Saturday, April 13th for a Day of Free Classes! Join us in Bracebridge, ON! KIND's Winter Yoga Retreat is all about slowing down and growing your personal practice in a beautiful, natural space. We invite you to join KIND teachers Ellen Reesor, and Tina Addorisio for three days of deep breath, mindful practice and beautiful community connection. A typical day will include yoga and meditation classes, options for indoor and outdoor group-based or personal activities, plenty of time for fireside relaxation, soaking in the hot tub, or enjoying a relaxing massage with an onsite RMT should you choose to pamper yourself further. 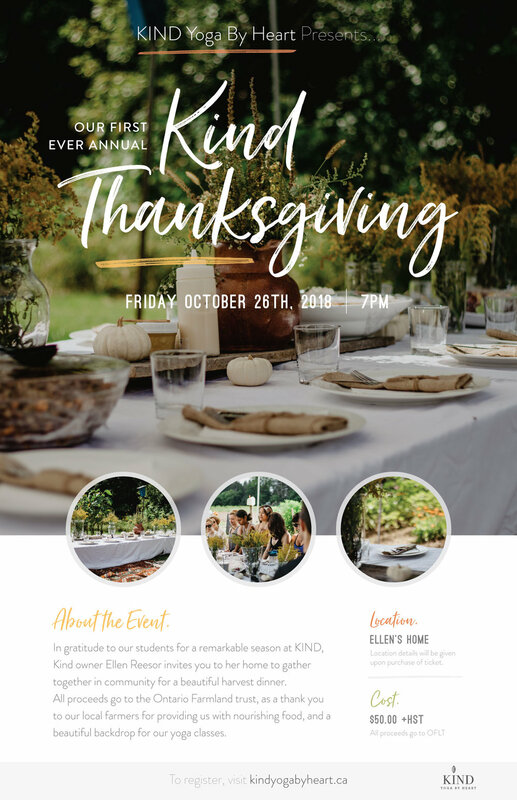 In gratitude to our students for a remarkable season at KIND, Kind owner Ellen Reesor invites you to her home to gather together in community for a beautiful harvest dinner. All proceeds go to the Ontario Farmland trust, as a thank you to our local farmers for providing us with nourishing food, and a beautiful backdrop for our yoga classes. Location details will be given upon purchase of ticket. Rise Empowerment by Tina Adorissio. Come enjoy an evening with yoga, meditation, journaling, and satsang. We invite you to join KIND founder Ellen Reesor along with Spirit Loft Co-Founder Andre Talbot for a one day mindfulness meditation and movement retreat. Dive deeper into your mindfulness practice and learn from one of Torontos’ leading mindfulness teachers and former CFL player Andre Talbot. Andre enjoyed a 10-year career as a professional football player in the Canadian Football League where he achieved numerous accolades including Grey Cup Champion. Since retiring from the rigorous and gruelling nature of athletic competition, Andre has continued to explore, research and share in different disciplines of movement and stillness practices. In movement, Andre blends his lifetime of practice in athletic development with the more subtle and mindful aspects of the embodied arts to assist practitioners in restoring a greater sense of connection, curiosity and playfulness with their body through movement practice. Andre's interest in mindfulness and stillness practices led him to formal study and training with his mentor and teacher Poep Sa (Dharma Teacher) Frank Jude Boccio (Mindfulness Yoga, Zen Naturalism) and the Empty Mountain Sangha. Andre leads mindfulness meditation study and practice groups from a naturalistic heart centred approach. Andre believes that movement and stillness practices provide us with tools to deepen and strengthen our relationships, helping us to build a greater sense of community and well-being. He shares his lifetime of experience and dedicated practice with others, at his Toronto based studio the Spirit Loft Movement & Yoga Centre. He also leads teacher trainings, retreats and workshops. Ellen first found yoga at the age of 14 and quickly fell in love with the way it made her feel. After countless hours of practice she went on to complete a 200-hour YTT in Hatha yoga and a 500 hour Moksha Yoga teacher training as well as a 100 hour Moksha Yoga Flow training. Ellen is currently enrolled in a 10 month Embodied Arts and movement Teacher Training and Mentorship Program through Spirit Loft Movement and Yoga Centre downtown. Though Ellen was very appreciative of her past experience in yoga she believed there was a major component missing in the yoga industry which lead her to establish the first nature based yoga facility in the GTA on her families’ farm that was based on her belief that practicing mindfulness and yoga in nature has a synergistic effect on our mental, spiritual and physical health . The power of both nature and yoga together is greater than the sum of each individually. Over the years, yoga and nature has deeply enriched her life and she continues to find fulfillment in helping others to find the same joy that it has brought her. 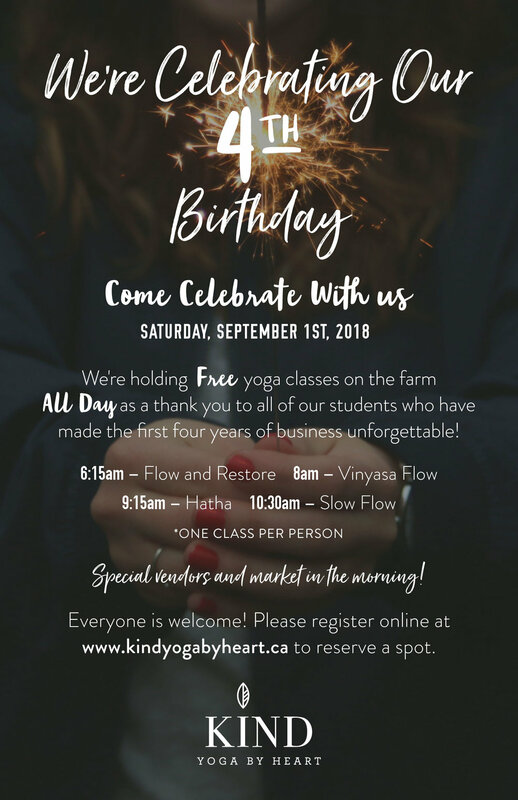 Come Celebrate the 4th Birthday of KIND Yoga By Heart! ENJOY FREE CLASSES ALL MORNING! We're holding FREE yoga classes on the farm as a thank you to all of our students who have made the first four seasons of business unforgettable! There will be tea and, snacks, and special vendors. * One Class Per Person. Get cozy with us in our greenhouse under the stars at dusk. More details to come! This acro yoga playshop experience is open to all levels and will evolve as we move in harmony together. We will explore acro yoga postures, movements, and calibrations to discover how we can access a practice that moves with ease. Unlock new skills with heightened awareness in alignment, strength and connection. Held outside our greenhouse amongst Farmers Fields and gorgeous landscapes. As a thank you to our students, and a jolly kick-start to a brand new season! Join us on Saturday, April 7th for a Day of Free Classes! KIND's Winter Yoga Retreat is all about slowing down and growing your personal practice in a beautiful, natural space. We invite you to join KIND teachers Ellen Reesor and Tina Addorisio for three days of deep breath, mindful practice and beautiful community connection. We'll be hosting pop up yoga classes at the Main Street Bakehouse in Stouffville! Join us for a sunrise practice at 8:30am and enjoy a delicious coffee and your choice of baked glory with some amazing community and conversation for only $20.00! There is very limited space so be sure to reserve your spot through the website as soon as possible! Come out to Kind Studio on Halloween! We will carve pumpkins in costume and do a LIVE music yoga class to the light of their glow. Winner of the best carved pumpkin receives a 5 class pass! RETREAT TO THE FARM THIS FALL! KIND’s fall yoga retreat is about taking a pause to enjoy the outdoors. Join us for a restorative day of yoga amongst nature right here in Markham. 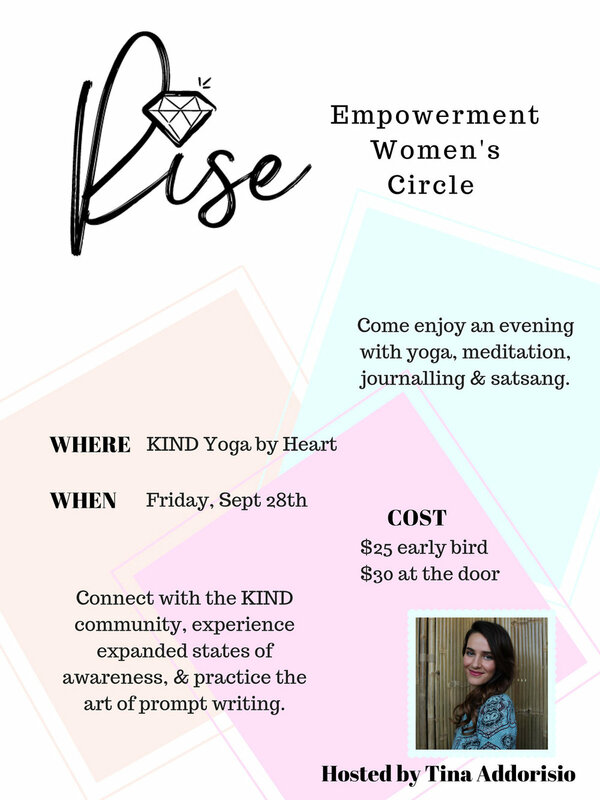 We invite you to join KIND founder Ellen Reesor along with Emma Drudge (back by popular demand!) for one blissful day of mindful practice and community connection with a natural backdrop that cannot be beat. A lovely journal and pen for you to use throughout the day and take home with you. KIND was invited to host yoga classes for this wicked festival coming this summer. Bring your family and friends for amazing music, delicious cuisine, yoga and so much more fun!! Kids under 12 get in FREE! Purchase your tickets online while they last, this is something you don't want to miss out on. Drawing on ancient and contemporary practices SOMATIC YOGA is the beginning of a journey through and with the bod, connecting the physical with the spiritual to support mental wellness. This class is tailored to those who struggle with physical or mental illnesses, or for those who simply want to slow down and experience a more embodied practice. Central to the practice is an awareness of mental wellness, felt sensations, nervous system fluctuations and how to recognize individual boundaries within yoga. Participants will connect to a deeper understanding of their bodies through yoga and somatic healing. Jenni-Leigh is certified in Positive Psychology and Spiritual Coaching. She is currently in her advanced year of Somatic Experiencing therapy certification (Trauma Therapy) and specializes in Therapeutic Yoga with a strong focus on mood disorders (PTSD, anxiety and depression) and stress management. COST: $25.00 in advance OR $30.00 at the door. Behind each pose is a story of epic proportions! Delve through the legend behind all of your favourite poses and feel the stories played out in your own body as a practice. Join us for a night of laughter, fun and so much knowledge. Let's come together and lend a hand in helping to preserve this remarkable species. Some 35% of world crop production depends on pollinating species like butterfly's and bees. The consequences of the decline in these pollinators' population is becoming an increasing concern, but we can do our part to turn things around! Come one come all and join us on the farm for a day of gardening, community, and a care for our planet. Please bring any gardening tools you have and any wildflower seeds you'd like to contribute. On Friday April 28th at 7:30pm let`s come together to discuss and challenge our societal standards of beauty and what it means to be a feminist within a society that profits off of our self doubt. Students will be lead through a powerful yoga class centered around reclaiming their beauty as an internal feeling rather than a standard set by external influences. -Be sure to register online in advance to reserve your spot! As a thank you to our students, and a jolly kick start to a brand new season join us on Saturday, April 1st for a Day of Free Classes! *Class is free for anyone who shows up in costume. We will carve Jack-O’-Lanterns and do yoga to their glow. The KAIROS Blanket Workshop is a teaching tool to share the historic and contemporary relationship between Indigenous and non-Indigenous peoples in Canada. The KAIROS Blanket Exercise is an interactive learning experience that teaches the Indigenous rights history we’re rarely taught. Developed in response to the 1996 Report of the Royal Commission on Aboriginal Peoples—which recommended education on Canadian-Indigenous history as one of the key steps to reconciliation, the Blanket Exercise covers over 500 years of history in a one and a half hour participatory workshop.